President Obama proposes to spend $2.63 trillionº in mandatory spending in fiscal year 2016, an increase of more than 5 percent over the 2015 enacted level. Mandatory spending includes earned-benefit programs that people pay into, such as Social Security and Medicare, and accounts for 65 percent of all spending in the president’s proposed 2016 budget. Lawmakers do not choose the exact amount of money spent on these programs, because they are dependent on the number of people who qualify for benefits, but rule changes can indirectly affect how much is spent. This chart shows how the president would allocate that spending. 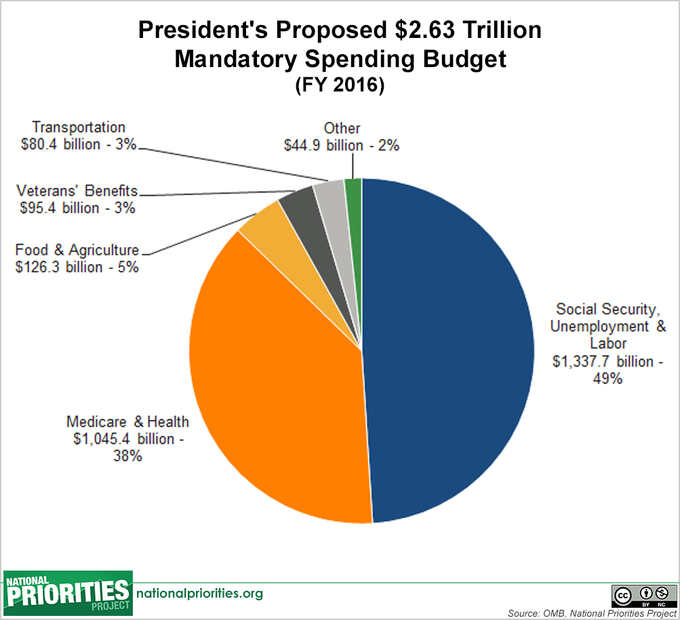 º Totals in chart do not equal $2.63 trillion because spending on Government (administration) and International Affairs are less than zero and are omitted in the mandatory spending pie chart. Lower than zero spending can occur when segments of government have surpluses from previous years that they return to the federal government. “Other” includes categories of spending that contributed less than 1 percent of mandatory spending each, including Energy & Environment, Military, Education, and Science.